One of the key parts of organising an event is dividing up work and who does what. Share the work helps a group agree what needs to be done. The tool can be used in a formal way to allocate task or in a less formal and fun way, such as a game called Role Bingo. Share the work helps you plan out all the tasks needed to make an event a success. Decide as a group what tasks need to be done and write each task in one of the bingo sheet squares. Divide and allocate tasks between a group and when they’re done cross then off your sheet! Role Bingo was co-​designed with members of community organisations on the Isles of Mull and Iona, and the Kyles of Bute, and Share the work tool version was co-​designed with professionals at Lancashire Care NHS Foundation trust. 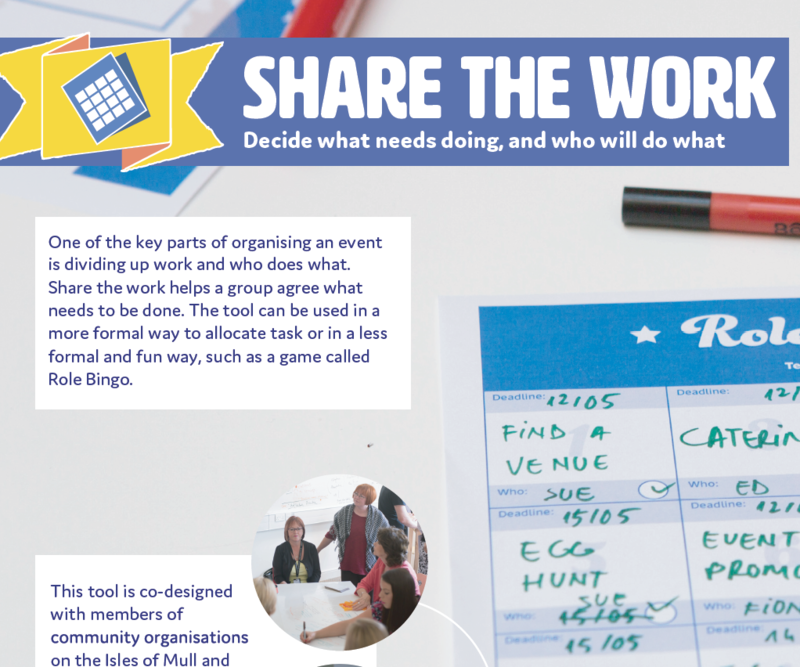 Role Bingo has been renamed as Share the work tool: The new title provides a more formal description, although it can still be used in a less formal way as instructed in the tool guideline. Small details has been added to the tool to help fill in the tool. Added few changes in the wording to give more meaning to the tool.